It has taken me all week, and all my attention to get this little sample made. I am hoping that crocheting a length of trim goes quicker. It is a tricky pattern because the various elements are crocheted in both directions. To make the elements match has been a trial, and mostly error, process. I think this edging will make a lovely trim for Easter decorating. I am thinking of using it as a runner or towel edging. Both would be about the same length. I still haven’t gotten around to emailing and thanking everyone who commented on my last blog post. I will do that soon. 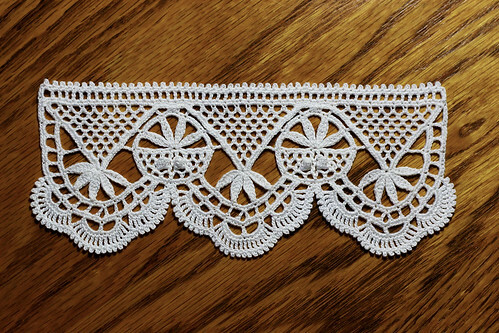 This entry was posted on Tuesday, February 25th, 2014 at 6:36 pm and is filed under Craft, Crochet, Doily, Lace and Needlework. Tagged: Craft, Crochet, Doily, Lace, Needlework, Thread. You can feed this entry. You can leave a response, or trackback from your own site. It’s really beautiful! With your creative background, you have a lot of skills to draw on to improve or design. Your projects are always a delight! That’s a lot of work. Fabulous results!